Dear Colleagues: This is a special time for all of us as we celebrate the 150th anniversary of our medical society. Growing from a handful of physicians to over 3,600 members now, the Sierra Sacramento Valley Medical Society (SSVMS) has become a powerful guiding force for our profession that enables us to continue serving our patients. As your 2018 President, I look forward to engaging with you on the many issues that impact our profession. As physicians, we all seek the same thing. Doing what is best for our patients and ensuring that our profession endures. 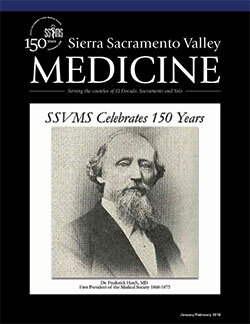 I invite you to download a copy of SSVMS’ 2017 Annual Report and to consider making a tax-deductible donation of $150 to commemorate SSVMS’ 150 years of serving the Sacramento region. You may donate online here. Please let me know what your Medical Society can do for you. rajiv.misquitta.gmail.com. Make a tax-deductible donation of $150 to SSVMS’ community programs to celebrate 150 years of physicians giving back to the community. Donate Today! Meet with a group of colleagues to connect with one another to discuss personal and professional successes and challenges. This is a great opportunity to socialize with professionals who understand and identify with what it means to be a physician. CMA Webinars are no cost for members. Click here to explore on-demand webinars. Dr. Lawson is motivated as a SPIRIT volunteer by the gratitude shown by patients and the obvious need for patients to access quality specialty care, “...giving back to the community is a way to show my gratitude and share my good fortune with others. Philosophically, as a physician my mission has been to help reduce suffering regardless of reimbursement.” Read more. Tuesday, January 9, 2018, 10:00am PST. Register here. Wednesday, January 10, 2018, 1:30PST. Register here.